At the Science Extravaganza, SJSU students and industry professionals will help students build foam tube roller coasters to learn principles of physics (photo from a previous year courtesy of the Engineering Student Success Programs). SAN JOSE, Calif., — On Saturday, Feb. 8, approximately 500 Bay Area middle school students will be on the San Jose State University campus for the annual all-day Science Extravaganza event, hosted by SJSU’s Society of Latino Engineers and Scientists (SOLES) in partnership with the Bay Area Chapter of Latinos in Science and Engineering (MAES) and the Charles W. Davidson College of Engineering. 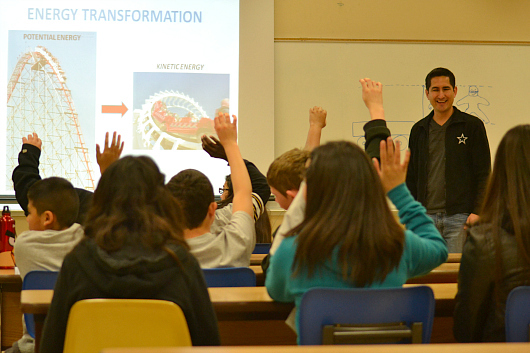 Led by SJSU students and local industry professionals, middle school students will participate in a variety of hands-on academic enrichment activities to help them get excited about college and potential STEM (science, technology, engineering and math) careers. Building foam tube roller coasters to learn the principles of physics such as friction, centripetal forces and acceleration. “Think Like a Robot,” led by Cisco, where students will create code to make a robot perform a specific task. “Electromagnetic Motors,” where students will build their own motors while learning about magnetism. Some students will also participate in an event on the principles of aviation. “Science Extravaganza is a fantastic opportunity for young students to see the potential and opportunity in STEM fields,” said Jared Tuberty, executive director, Engineering Student Success Programs. More than 100 SJSU student volunteers will serve as leaders and mentors during the event and more than 24 MAES technology professionals and industry representatives will serve as workshop facilitators to promote STEM and the value of higher education among participants. Twenty-one Santa Clara County schools have been invited to participate in this year’s event. A number of local companies are supporting Science Extravaganza, including AMD (Advanced Micro Devices), Santa Clara Valley Water District, Cisco, Blach, Engineers Without Borders, The Society of Women Engineers, and The American Institute of Aeronautics and Astronautics.